I've been a technician since 1994 and am ASE certified. I've worked at Jiffy Lube, Mieneke, and at an independent shop. I have experience in everything from preventative maintenance to heavy equipment. I enjoy working with people and helping to resolve any problems your car is having in a timely and professional manner. Joseph was very professional, knowledgeable and explained the problem in detail and reassured that it could be fixed. Joseph was prompt and it was easy to get in touch with him via text messaging. He found 3 problem areas in the vehicle pre-purchase inspection that I will make the dealer aware of, which will help me with the buying decision. 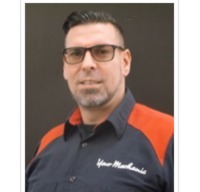 Awesome mechanic Super knowledgeable and the only one I will let touch my van again! He is fast and pays attention to the details. Joseph was on time and very professional it took him 20 minutes to complete the job and he was gone . I give you 10 🌟's. Joseph was great! He was prompt and completed the work quickly! The expense was more than fair and much better than many places I've been to before. I've been and will continue recommending this service and him to everyone. 3rd time using Joseph and great as usual Punctual, honest and does a great job Highly recommended! Joseph was great. He was slightly early and finished well before the allotted time from the appointment set up. Super efficient and a great guy. Very professional. We'll use him again when the need arises. Prompt fast and courteous. Knowledgeable. very quick when I requested service I was told this job was billed for one hour and forty minutes, but Joseph completed in 25 minutes. Do I get a refund on time that was not used?? Probably the best service I have ever had!!!! Joseph was on time, polite, kept area clean and explained everything he was going to do. No hidden gotchas. Some parts were not needed and they were promptly taken off my bill. Excellent job and service. Outstanding guy and mechanic. Unfortunately, wrong part was sent to him, but I am sure that he would have done a fantastic job. Joseph communicated with me well before the appointment and arrived at the agreed time. He was courteous and professional and completed my repairs promptly. I will not hesitate to use him again. 5 Star service. Feel relaxed and feel comfortable with entire experience. Feeel he is very knowledgeable and explained everything to my level. Great first experience with Your Mechanic. Joseph was punctual and professional I was advised previously by an oil change shop, that I needed a full replacement of my oil pan and gasket, however upon inspecting my car, Joseph was able to see that it was simply a drain plug issue, saving me quite a bit off what I was expecting to pay. I am very happy with the service and honesty of Joseph and will gladly utilize his services in the future as needed! Always great service and attitude. So much easier than having to go and wait for my car to be serviced. Very knowledgeable and efficient. Highly recommend Joseph. Joe showed up on time, diagnosed the issue, gave me great insights about the problem and ended up saving us money. He provided excellent service, was professional, courteous and had a great attitude. I highly recommend Joe. Did a great job fixing our master cylinder and did it fast! Very friendly and knowledgeable. He was fast and told me what he was doing which helped me feel clam.